Many years ago when I performed a juggling show round the world, I heard rumours of a South Pacific island where all the women were jugglers of exceptional skill. Initially, I considered the story to be a kind of urban legend amongst the juggling diaspora, but the exoticism and allure of the idea of Pacific islands inhabited by juggling women remained with me. In 1993, I happened to be travelling from New Zealand across the Pacific to California. 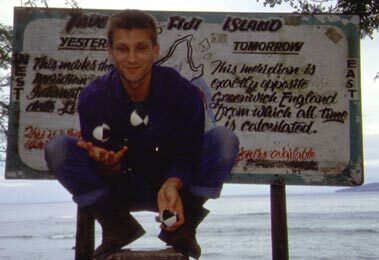 I stopped off in Fiji to juggle with my hands on either side of the dateline, which cuts directly through the south western part of the island of Taveuni. Unless you’ve had to deal with the effects of the dateline directly, it’s rather difficult to grasp the implications of it. In the picture above, I’m juggling with one hand in yesterday and one hand in tomorrow — although in practice (of course) the island maintains one timezone across its entirety. It still strikes me as the most amazing coincidence that because the Prime Meridian was defined as running North-South through Greenwich in London, that the confusion of the dateline is only felt in the Pacific Ocean. Imagine if the Prime Meridian had been defined in Moscow, Beijing or Washington. The dateline would have run through a major landmass on the other side of the planet — with the potential for enormous confusion wherever that might have been. A: When do you want to meet? B: Oh, how about yesterday? A: Okay, about 3pm under the clocktower? B: Sure thing — see you back then. 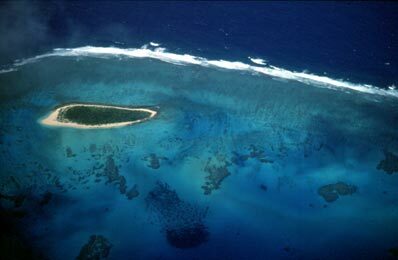 Tonga itself actually lies east of the 180th Meridian, but west of the dateline which makes a large detour around the archipelago. Time confusion aside, I decided that, being so close to the island kingdom, I couldn’t miss the opportunity to investigate the reports that I’d heard — and discovered that they had indeed been more accurate than I’d believed. Flying in to Tonga has been known to make even the most seasoned of scuba divers salivate — I heard gasps from fellow passengers as we flew in over its reefs and lagoons. I was planning to spend two months in the Ha’apai archipelago, staying with a family who run a guest house there. My search for juggling women on the island was made simple when it turned out that the daughters of the family could all juggle. Paia, the eldest, showed me just how accomplished she was by picking up six of my juggling balls and instantly launching into a sustained six-ball shower pattern. Paia considered me quite eccentric when I showed her the cascade (figure-of-eight) pattern which is the most common one that people learn throughout the world. It was cheating, she said. And so there was no choice but to spend many an afternoon engaged in ball-showering endurance contests with her — much to the amusement of the local boys, who also thought me rather eccentric because they had never seen a man juggle before. The words of the song are archaic, and the meaning of the words themselves have been lost over time. I wondered if anyone might know (if only vaguely) what the lyrics meant, so I asked around. People told me that the lyrics was a mixture of ancient Tongan, Fijian and Rotuman languages and that there would be very few people who would know what the words might mean. I guessed that the meaninglessness of the lyrics might actually be an important part of the song’s function and account for its continued usage — helping the juggler enter the trance state in which they juggle at their best. 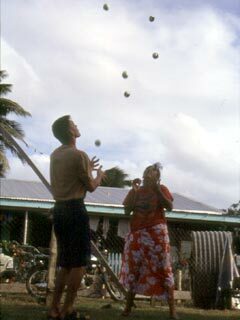 There are a multitude of myths surrounding juggling in Tonga. I was, for example, told of the legend of Hikuleo, the goddess of the underworld, who snatched those who approached without authorisation, plucked out their eyes, and juggled with them. I resolved to steer well clear of the underworld (whether invited or not) for the duration of my stay. The legend also reminded me of a story I’d heard about the “Friendly Islands” — as Tonga was dubbed by Captain Cook when he first arrived. Apparently, he and his crew had been earmarked as dinner by the locals, but two rival chiefs had argued over the menu and Cook and his crew left fed and watered and thinking the islanders most hospitable. How deceptive appearances can be. Throwing games also feature as a mechanism for teaching children about the ancestors, and as courtship rituals. 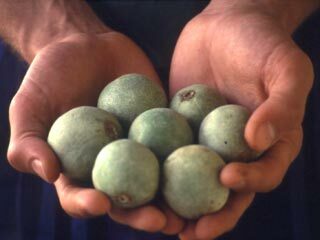 I was told anecdotally that the best juggler — the one who could juggle for longest with the most balls — became one of the most eligible women in the islands and had excellent marriage prospects as a result. 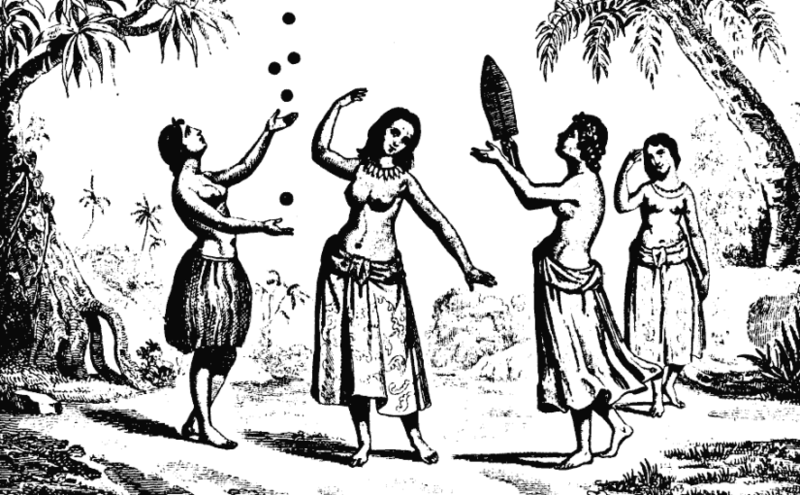 I also found out that separate island groups had developed different juggling skills. In the more northerly Vava’u group, fire swinging (of the kind practiced with pois by New Zealand Maoris) is favoured over the ball-showering technique found in the rest of Tonga. 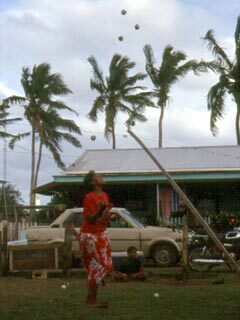 In Fiji and Samoa, however, it is staff swinging that is more popular and is more of a male pastime. Sadly, I also found that the juggling tradition was being rapidly eroded by more contemporary games such as netball, as well as new pastimes like watching TV. The younger girls were much less likely to be able to juggle than their elders. It’s a great shame that there are so few records of such an extraordinary aspect of the art of juggling. I’ve included the address above because I found people still referencing it, and hopefully it’ll point them to this entry instead.